All lanes on northbound Interstate Highway 280 near Saratoga Ave in San Jose were blocked Wednesday night due to a fiery big rig, CHP officials said. Ian Cull reports. 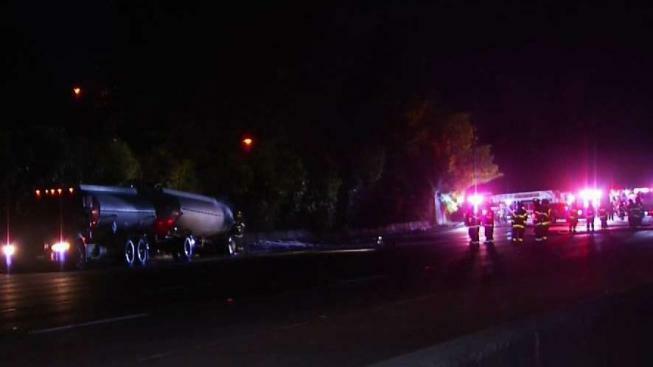 All lanes on northbound Interstate Highway 280 near Saratoga Ave in San Jose were blocked Wednesday night due to a fiery big rig, CHP officials said. The big rig was reportedly filled with about 8,000 gallons of fuel but the San Jose Fire Department was able to put the fire out before the tank heated up. "The product did not leak, the safety features did appear to do their job and this was essentially a vehicle fire," said SJFD Battalion Chief Darren Wallace. "The product is contained inside the tailors at this point." A few hundred cars were blocked just after Saratoga Avenue and traffic backed up nearly four miles to Highway 17 for about two hours until one lane reopened at around 10 p.m.
Officials had to bring in an empty truck to unload the ones that caugh fire before removing the entire trailor from the road. There's no estimated time of reopening for the other closed lanes. No injuries have been reported but motorsist are advised to avoid the area.